Before you read any further, this post focuses on Canadian laws and regulations for drones up to 25 kg. Please note that Canadian commercial UAV regulations have been evolving quickly, and will have more changes coming in 2018. I will continue to update this post as soon as possible as regulations change. When do I need permission to fly? If you are operating drones for anything other than recreation/flying for fun, you generally need to obtain a permit called a Special Flight Operations Certificate (SFOC) from Transport Canada. This applies to the use of drones for work or research. Is it possible to fly my drone commercially without a permit? There are ways to operate UAVs under an exemption, but you must meet strict requirements. The most difficult exemption requirement that is often missed is that you must be operating the drone at least 5 nautical miles (9.3 km) from a built up area. Transport Canada defines a built up area as “anything larger than a farmstead”. This basically means that you have to be very remote in order to be able to fly commercially without an SFOC. Exemptions are broken down into 2 categories: (A) UAVs that are 2 kg or less, and (B) UAVs weighing 2-25 kg. In the first category, the operator must meet 37 safety conditions to operate under the exemption. For the heavier weight class, there are 58 conditions that must be met. Details on these conditions are discussed in this TC Advisory Circular. Transport Canada released a useful flowchart that helps to understand what process you should follow – see Figure 1 below. How do I obtain a permit for commercial drone use, and how much does it cost? A simplified application is intended for those that have no intention of flying above 300 ft (91 m), always more than 3 nautical miles (5.5 km) from the centre of an aerodrome, only in Class G airspace, among other restrictions. If you are unable to meet the conditions of this simplified framework, you can apply under the complex application, which will require more detail to be approved. Do I have to apply for a permit for every commercial UAV operation, or will the permit be valid for a certain date range? When you first start in the realm of commercial UAV work, you have to apply for a permit for each individual job that you have planned, with the flights to occur on a specific date. Waiting for your first permits can be prohibitive to conducting successful business, so it’s important to plan ahead and be proactive with your SFOC application(s). 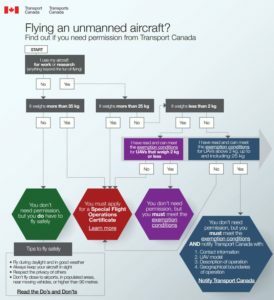 After you have built some trust with Transport Canada (some successful UAV operations with no incidents), you will eventually have your permit extended by a few months or possibly 1 year, which many refer to as a “blanket permit”. In my experience, the number of flights and individual permits necessary before being considered for a blanket permit will vary by province, and by the inspector that is assigned to you. How long does it normally take to get SFOC approval? Under normal circumstances, standard waiting time for permit approval is 21 days but this can really fluctuate depending how busy Transport Canada staff is with applications. Back in 2014, I found that waiting times could easily extend from weeks into months, but the process has become centralized and more streamlined since then. What happens if I don’t play by the rules? Transport Canada is clear about penalties surrounding illegal commercial drone use. (1) If you are believe you are flying under an exemption but do not meet all of the conditions, you will no longer qualify to fly and will be forced to apply for an SFOC. (2) As an operator, if you fly without an SFOC and you should have one, you can receive a fine of up to $5,000 as an individual, and up to $25,000 for a corporation. (3) If you have an approved SFOC but do not follow the requirements, you can receive a fine of up to $3000 for an individual and up to $15,000 for a corporation. Okay, there are punishments established… but are they ever enforced? Although this can be dependent on public reporting (rather than a bunch of Transport Canada inspectors out on the hunt), there are plenty of examples of enforcement for illegal drone use. I’ve seen drone pilots that were flying near a seaplane base in Vancouver (not the smartest idea) getting approached by police. I’ve also read about a number of fines being handed out by Transport Canada over the last few years. 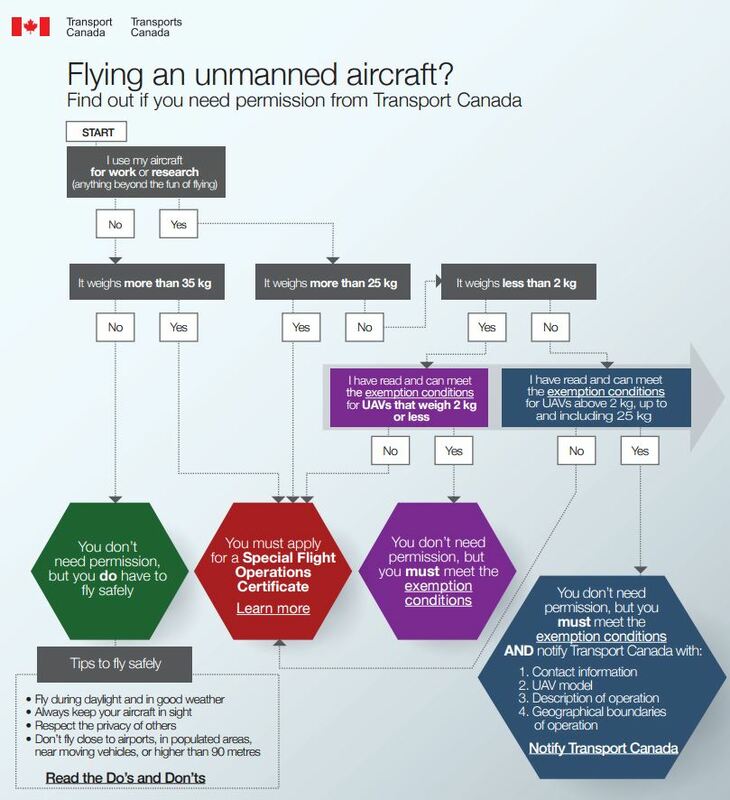 What laws and regulations apply to commercial UAV use in Canada? Civil unmanned aircraft are directed by the Aeronautics Act, with specific guidance provided under the Canadian Aviation Regulations (CARs) created under this Act. Some examples of the specific regulations that apply to UAVs under the CARS are listed below. In summary, SFOC approval is a central part of the whole process. 602.41 – No person shall operate an unmanned air vehicle in flight except in accordance with a special flight operations certificate or an air operator certificate. 603.66 – No person shall conduct a flight operation referred to in section 603.65 unless the person complies with the provisions of a special flight operations certificate issued by the Minister pursuant to section 603.67. 603.67 – Subject to section 6.71 of the Act, the Minister shall, on receipt of an application submitted in the form and manner required by the Special Flight Operations Standards , issue a special flight operations certificate to an applicant who demonstrates to the Minister the ability to conduct the flight operation in accordance with the Special Flight Operations Standards. (f) any condition pertaining to the operation that the Minister deems necessary for aviation safety. What happens if my SFOC application is denied? When submitting an application for commercial drone work under an SFOC, it’s not uncommon to have some back and forth with the Transport Canada representative that is assigned to your file. As part of the review process, they often need more clarification for certain details you have included or omitted, but the subsequent reviews won’t put you to the back of the queue. I have too much going on right now… can I just pay someone to write my SFOC for me? Yes, there are a number of firms that are offering SFOC writing services. I also provide this service, having helped many others reach approval with Transport Canada. Connect with me for more information on this on the permit page. I’ve seen SFOC applications that vary greatly in terms of their length, but an SFOC application does not have to be a 20+ page document. If it’s succinct and includes all the relevant information for the TC inspector, you can be on your way to operating in the commercial sector without too much trouble.